Fledger: a Novel, by Nicholas Barrett. NYC, Macmillan Publishing Co., September 1985, hardcover $13.95 (207 pages). Ever since Adams’ Watership Down was published in 1972, just about any “realistic” nature fantasy centered upon one particular species has been “high profiled” as a “Watership Down for” (whatever species is featured). Fledger is certainly a Watership Down for puffins. A flock of puffins is returning to Land (specifically a bleak, rocky shoreline) to dig burrows and lay eggs after three years of living at sea upon ice floes. Rock Samphire, a hen, is distraught and insulted because her mate, Sorrel, will not listen seriously to her dreams of impending disaster if they continue to build their rookery as puffins always have; on the Land and upon a small island just offshore. Ringleader, the flock leader, dismisses her dreams because the Golden Lord only sends true dreams to flock leaders like himself, and he has not had any nightmares. Rock Samphire stops protesting, but she builds a secret burrow for her egg on the other side of the island, apart from the other puffins. This just removes her from their protection, and she is eaten by the swaabies (great black-backed seagulls) just after laying their egg. Ringleader orders Sorrel to raise the chick, Goldie (Golden Samphire), in secrecy. A lightning strike from the almost-permanent storm clouds above collapses a rock column across the strait, connecting Puffin Island to the Land. This is interpreted by Goldie as a sign from the Lord that he should leave his burrow and join the other fledgers at sea. But after an unsatisfactory encounter with an atheistic seal, Goldie is horrified to discover that all the other puffin fledgers have been eaten that morning before they could take to the sea, by a horde of rats who have overrun the puffins’ burrows. Only the crippled Ringleader is left, humiliated by Hemlock’s sadistic rats. Ringleader orders Goldie to escape to sea and warn the flockers not to return, but before he can, he is captured by the rats. Goldie is sentenced to fight to the death with the rats’ champion, Bubo. But before the fight can take place, he is rescued by Hellebore, a rattess belonging to the faction of Mezereon, the pack leader back on the Land. Briefly, the rat pack is divided into two factions, the legitimists led by Mezereon and the young rebels led by Hemlock and Bubo. Hemlock’s gang has taken over Puffin Island despite Mezereon’s order against doing so, and his rats are waiting for the adult puffins to return so he can kill or enslave them. Mezereon’s plan is to help Goldie to escape to sea (after the fight) and warn the fledgers against returning. This is Goldie’s plan, but now he would be doing it on Mezereon’s terms. 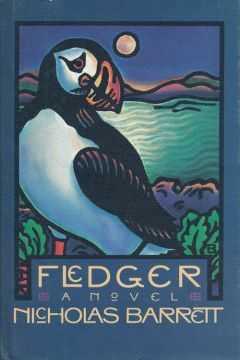 The jacket blurb says, “And when marauders invade the island, it is Goldie, who through heroic acts of bravery and perseverance, must rescue his fellow puffins from destruction.” Fledger is actually more complex then that. The novel splits to follow four factions, each involving treachery or self-interest: Hemlock’s, Bubo’s, and the rats on Puffin Island’s; Mezereon’s, Hellebore’s, and the rats on the Land; Goldie’s and the puffins at sea who want to rescue Ringleader; and their leader, Sandpiper, with the puffins who don’t want to rescue Ringleader. On the other hand, maybe Goldie’s faith in the Golden Lord is an attempt to copy the rabbits’ devotion to Frith. Fledger is, above all, a Watership Down for puffins. Fledger is advertised as A Book For All Ages. Instead, it seems to be a Young Adult novel hoping that it will be mistaken for an adult book. The dust jacket is by Anne Bascove, an artist whose paintings have had many exhibitions in America and in Europe.